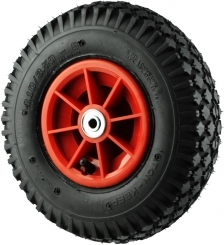 Pneumatic wheels with polypropylene (HDPP) rims are most often used where loads are lighter and/or moved less often. These can be assembled with bearings or bushings (sizes to suit most axles). The wheels assembled with bushings are recommended for corrosive and wet environments.